** Vengeance for Android? Find out more at Rodent News. Rodent's Revenge, Copyright (c) 1991 Microsoft Corporation, was a game developed for and included with the 1993 Microsoft Game Pack for Windows. It was developed by Christopher Lee Fraley. We certainly owe Mr. Fraley a debt of gratitude for his interesting concept and related pioneering work. 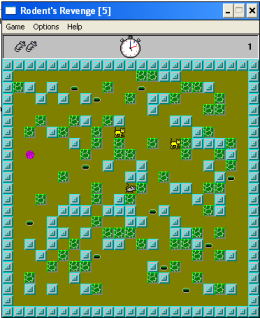 The Rodent's Revenge game revolves around computer controlled cats chasing a user controlled rodent around the game board. If a cat catches the rodent, one rodent life of three allocated for game play is lost. The rodent may push bush pieces, which may be used to surround the cats. When all cats on the board are completely surrounded, having no place to move, the cats turn into cheese pieces, which can be eaten by the rodent (the rodent moves into their location) earning the rodent 50 extra game points each. 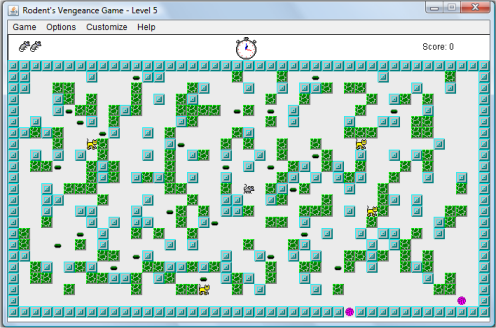 There are 50 playing levels for the game, and when a player manages to turn all of the cats allocated for a given level into cheese, the rodent is advanced to the next higher level. Ultimately the player tries to collect as many points as possible during play before three rodent lives are taken by the cats. Rodent's Revenge has remained static for the past 15 years. There has been no maintenance for the game, no enhancements, updates or fixes. Rodent's Vengeance gives us a chance to address game needs and make it better. On the next page we will look at player issues with the Rodent's Revenge game and how Rodent's Vengeance addresses these. I have enjoyed playing the Rodent's Revenge game since the mid-ninety's when I was introduced to the game by my brother Rick. After completing my post-bacc computer science degree I took on the task of creating my own version of the game in Java. I felt that it would be a worthy academic challenge, and would certainly brighten up my resume. Had I any idea of the complexity of the task, I would have been most hesitant to start work on it. When the game was completed I wanted to share it with others who know and love the game. So, here it is. You may judge for yourselves whether it was worth the effort.